Earlier this year, United States’ International Trade Commission (ITC) decided to investigate Nokia’s complaint against Apple, and consider an import ban on iPhone and iPad devices in the US. After Apple accused Nokia of conspiracy and cancelled patent license negotiations, Nokia filed numerous suits, accusing Apple of unauthorized usage of Nokia’s patents in almost all devices. Nokia warned investors that the litigation against Apple could cost about €100 million annually, and Nokia’s annual revenue from Apple last 4 years was about €150 million. Apart from Nokia, Qualcomm is in an open war with the chipmaker Qualcomm, also filing anti-trust complaints and accusing Qualcomm of creating a monopoly. The war between Apple and Qualcomm is really ugly, and the recent news is that Qualcomm requested an iPhone ban in the United States from ITC, because Apple withheld, or better to say instructed its chipmakers that pay royalties to Qualcomm to stop paying for Qualcomm’s patents. This week Qualcomm issued a financial warning that the Company expects $500 million less revenue in Q3, because Apple instructed its chip manufactures to stop paying royalties to Qualcomm. This means that annually Apple pays up to $2 billion to Qualcomm, what is significantly higher than the €150 million it used to pay to Nokia per year. The good thing for Nokia in this story is that Apple is now under pressure from two strong patent players that both request an iPhone ban in the US, Apple’s most profitable market. 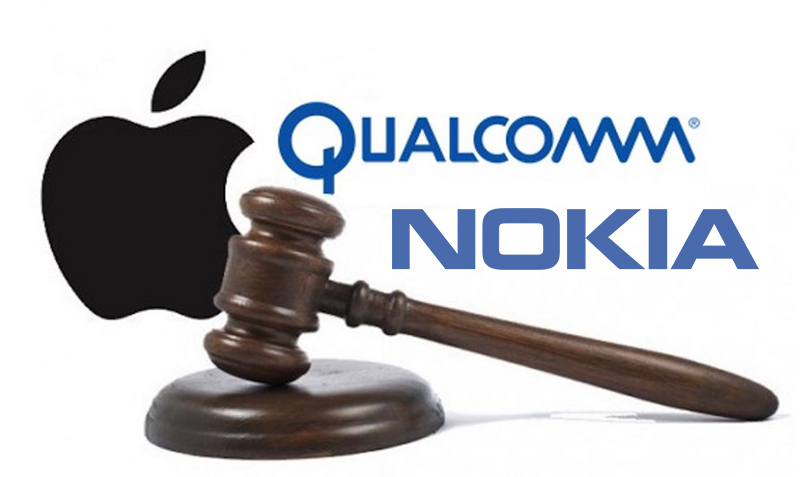 It’s possible that Apple will be more willing to negotiate with Nokia and accept Nokia’s term, because fighting one war against a patent giant you can’t counter-sue is bad, but Apple has two such wars to fight at the moment. Nokia’s executives are confident that Nokia will reach a positive outcome from the Apple patent war, and it’s more likely now when Apple is under pressure from Qualcomm.